Bird-dogging a Congressman who voted the wrong way on Amash-Conyers. Montgomery County Civil Rights Coalition (MCCRC) activists and coalition partners were on hand to hold him accountable. Major coalition pushback in a county with 2 Democratic Representatives who voted “Nay” on the Amash-Conyers bill. Try it where you live — you might get some good results! A veritable “Who’s Who” coalition of progressive organizations in Montgomery County has co-signed a letter to Representatives Chris Van Hollen (D-MD-8) and John Delaney (D-MD-6) expressing “profound disappointment” with their “Nay” votes on the Amash/Conyers amendment last week. The amendment would have explicitly defunded NSA warrantless surveillance purportedly authorized under provisions of the FISA Amendment Act. UPDATE, 8/3: ACLU of Maryland has co-signed the letter as well. 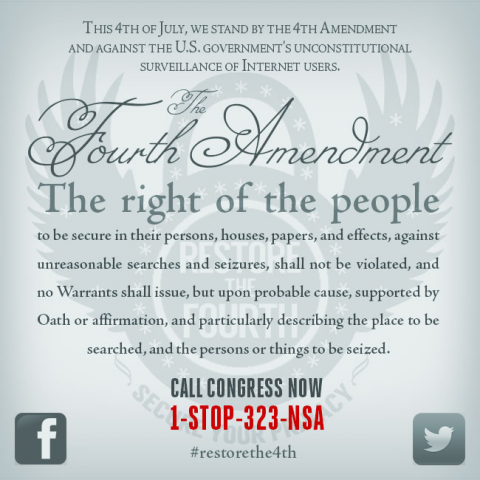 You are currently browsing the Get FISA Right blog archives for August, 2013.